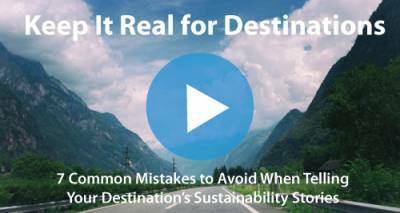 TrainingAid and Respondeco are hosting a free online training session "Keep It Real for Destinations: 7 Common Mistakes to Avoid When Telling Your Destination's Sustainability Stories" on December 8th, 2014 (4pm GMT), sharing practical examples of why effective sustainability communications can benefit your destination, and how to avoid common sustainability communication mistakes. The session will be led by Dr. Davina Stanford, Senior Lecturer at Leeds Beckett University and a responsible tourist behavior and destination management expert. This session is for anyone who's involved in promoting, marketing or managing tourism destinations, and we invite everyone - whether you can watch the live session or not - to share your questions about destination marketing and sustainability communications. Please post your questions by commenting here, or by posting them on Facebook, Twitter, or Google Plus with the hashtag #TourismTL. We'll be monitoring the questions before and during the event, and will try to address as many of them as we can!